Standing desk converters are the best desks compared to your existing ordinary working desks if you are ready to work standing up. To help you with proper ergonomics, the Imovr ziplift sit-stand converter is equipped with numerous wonderful features which give you more stability, capacity, and the ability to include a monitor arm. Imovr standing desk converter is designed with lustrous gas struts instead of clangy springs so it provides infinite stops. It is easy to move your desk up to any level by clutching the brake paddles. 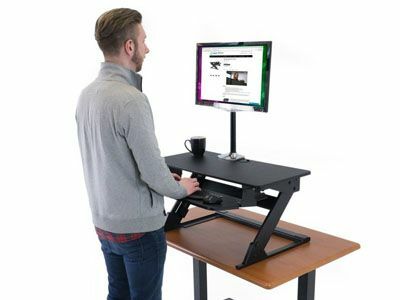 This standing desk allows you to adjust the keyboard tray angle which is not possible in most of the standing desk converter. It allows a slight adjustment ranges from +10 degree to -15 degree. It has 18”x 24” portable standing mat which is made up of 100% polyurethane for providing extra endurance. It is designed with plenty of work space which accommodates 2 x 24” monitors, a monitor arm, or a laptop. The ziplift standing desk converter has excellent build quality and fine aesthetic appearance. Its inner workings are well hidden by providing plastic casings and bending the metal. It is also provided with pads for preventing the keyboard tray and nice rubber stoppers for holding the base which permits the collapse of the unit without any metal touch. This standing desk doesn’t have any areas of concern about safety so it provides complete safety to its users. It gives the best performance and wonderful stability for all heights. It doesn’t allow any keyboard bounce or side to side wobble so there is no chance of monitor shaking while you use. You can adjust keyboard tray to give various typing angles and it also permits negative tilt option. The lowest height of the Imovr standing desk is a bit higher than other desks which enable the proper viewing angle. It is provided with the fixed distance between the keyboard and monitor so you cannot adjust the distance between the two platforms which might cause improper monitor viewing angle. Imovr ziplift sit-stand converters come at reasonable price around $350 and you can purchase it directly from iMovR.com, other online shopping websites, and from stores too. In short, Imovr ziplift sit-stand converter plays the significant role in your office and home while you do your work. Hope the above features, specifications, and advantages of Imovr ziplift sit-stand converter had provided you the right info so that you can choose this converter to convert your workstations sit to stand. What kind of standing desk converter are you using at your office or your home? Any queries, comments, and thoughts on the topic are welcome!